The Best Water Bottle in the World! Nalgene Water bottle or stainless steel waterbottle or ??? Well, now that you’re here, I bet you’re expecting me to tell you some absolutely fabulous water bottle made of gold and silver and that turns regular water into the fountain of youth. I am sorry to disappoint you… This bottle would be WAY to expensive and it would be so amazing that us ‘common folk’ probably couldn’t afford it if we wanted it. But at least the title got you to this page!!! I will instead tell you what water bottles I think are the best and other options and why they aren’t as good (not bad, just not as good). It comes with a sippy lid, so you don't spill water from the wide mouth. There is an indented section on the bottle where you can store ductape, and it is covered with a neat rubber cover to protect your duct tape. The lid is attached with a camping rope, so, it's easy to replace. It doesn’t leach and your water won’t taste like plastic. •	Unlike plastics, a stainless steel water bottle does not have any known unhealthy side effects, meaning that your water will taste like water and water only. Plus a stainless steel water bottle doesn’t rust. Easy to clean: The wide mouth is important so that you can clean this best water bottle easily and water filters usually fit over wide mouths so you can fill the bottle easily. (Note: Sippy lid: If you want a narrow opening, then you can get a removable sippy lid to put into the opening of the wide mouth that stops the water from coming out too fast). What about a Nalgene Water Bottle? Well, read more under plastics below. -	Narrow mouthed water bottles – These are hard to clean, and not as easy to fill (especially with a water filter). -	Plastics – Many plastics can leach into the water, and it is believed that these cause health problems. One of the ingredients to the plastic is Bisphenol A (BPA), which mimics hormones, particularly estrogen, which can cause feminizing of the body. This affects babies more than adults, but is still not great for adults. Plastics numbered 1,2,4,5,6 are unlikely to contain BPA, and Nalgene a company that makes plastic bottles now makes BPA free plastic. 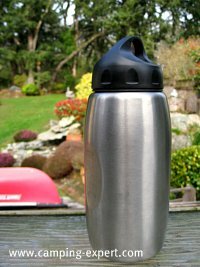 However, after using a Nalgene water bottle for years, and switching to a Stainless steel water bottle , the water tastes better. Plus, we don’t know what they will find next in plastic bottles that’s unsafe. Stainless steel has bee used for ages and is pretty healthy. Recycle-able bottled water bottles often use cheaper plastic, which is not healthy if re-used many times. So, if you’re going to use plastic bottles don’t use bottled water bottles, use a Nalgene water bottle or BPA free water bottles, and don’t leave them in the heat or sun, cause this allows more plastic to leach. The Plastic / BPA debate isn’t for sure, but for me, I’m not one that wants to gamble with health and hormones. -	Small water bottles, these you have to constantly fill. 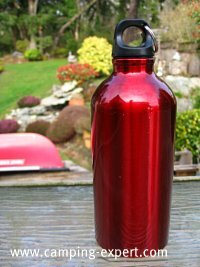 -	Aluminum water bottles- Aluminum has had debate for affecting the brain, and so aluminum bottles are usually used for camping fuel only. They often look like the red water bottle on the right. -	Use water only, no sugar crystals. I like to keep my water bottle a virgin water bottle that only gets water, because if you use other stuff (such as with sugar), the sugar feeds bacteria, making the water bottle become smelly mouldy grossness. -	If you do use crystals or your bottle gets dirty, to clean it, add a small amount of bleach in the bottle with water and let soak for a while, shaking now and then, and getting a cloth in and using a wooden spoon to reach into the corners inside. Then, rinse out MANY times, and then clean with soap. Although made with plastic, I use Water bladders on occasion. See other reviews on the GSI Water Bottle, or purchase it now!